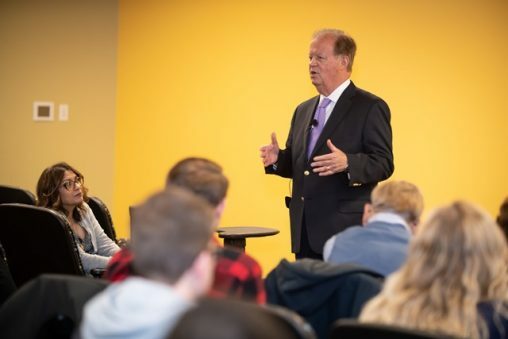 Tony Hall, ex-congressman and former U.S. ambassador, shared his experiences during a visit to Wright State University on April 1 as part of a talk to students on how to create social change. He remembers the exact moment when battling world hunger became his passion. It was during a famine and still burns in the memory of Tony Hall, ex-congressman and former U.S. ambassador. Hall would go on to become chairman of the House Select Committee on Hunger and was later appointed U.S. ambassador to the United Nations Agencies for Food and Agriculture, where he worked to ensure that food assistance was getting through to those in need. Hall shared his experiences during a visit to Wright State University on April 1 as part of a talk to students on how to create social change. The students packed the Student Union Discovery Room to hear Hall. Laura Luehrmann, political science professor and director of the M.A. Program in International and Comparative Politics, introduced Hall. “When we encourage our students to be forces for positive change in the world, I can think of no one better for them to meet than Ambassador Tony P. Hall,” said Luehrmann. One of the first bills Hall was able to pass in Congress was the Child Survival Law, which is now a $250 million program to immunize children all over the world against six major diseases. But not all of Hall’s efforts to be a change agent have been successful. He once introduced a resolution in the U.S. House calling on Congress to apologize for slavery. Hall fielded numerous questions from students — How do you get organizations to collaborate on projects? Why did you choose to focus on hunger? What is the root of poverty? Hall said hunger and poverty have been cut in half in the past 15 years. He said hunger could be totally eradicated but hasn’t been due to a lack of political and spiritual will. Currently, Hall is the fundraising chair of the Hall Hunger Initiative. One of the initiative’s projects is to help build the Gem City Market, a grocery co-op in west Dayton.